It may remain one of this decade’s best-kept tennis secrets, the question of the Roger Federer racket. When did one of the most instinctive shot-makers, with one of the most distinctive styles in the modern game, decide to hang up the weapon that had become as much a part of his image as the bandana and RF logo? Certainly he was one rare beast in adhering so firmly to his faithful 90-square-inch Wilson while all around him had either begun with, or migrated to, larger racket heads. It was not as though Federer had not tweaked things here and there, usually announced by a similar tweak in the frame’s colours—though they always remained within the white, red and black palette. It was simply, perhaps, that it continued to serve him so well: Why fix something that isn’t broken? For even though his dominance on the tour—11 titles in 2004 and 2005, 12 in 2006, followed by a steadily growing tally of weeks at No1, Grand Slams and World Tour Final trophies—was increasingly chipped away by Rafael Nadal, Novak Djokovic and Andy Murray, the performances kept coming. Nevertheless, it was increasingly obvious that players were following Nadal’s lead of playing high to Federer’s single-handed backhand, the hardest area for the Swiss to find the ‘sweet spot’. Federer admitted, in an interview with the New York Times in June 2011, that he had considered a change of racket—even tried out some different sizes—but the same question remained. Why change a winning formula—and when was there ever enough time to really put it to the test? I’ve tried bigger. The problem is we don’t have enough time to do racket testing. I’m always talking to Wilson about: ‘What else do you have? What else can we test?’ And who knows? Maybe down the road, I’ll change again. It’s also hard to change with all the success I’ve had with the racket. Come 2013, he did show signs of other adjustments. 2012 had been a gruelling year in which he’d played more matches than in any year since that 12-title 2006. Now aged 31, it was planning for longevity. And I actually was really close to playing with a different racket, just one tournament to see, at the end of the year in the exhibitions in South America. I played with a different string just to see how that was going to react. So I’m constantly testing and trying out. In the event, he lost his scheduled training block with a back injury from Indian Wells, a combination that affected the coming months. He won Halle but then lost in the second round of Wimbledon. How would he respond? On the surface, his decision to opt into two summer clay events, in Hamburg and Gstaad, was a surprising one. But then he was spotted using a new racket, and sure enough, it was a bigger Wilson. Suddenly a modest clay swing made sense, even though the results were far from ideal: He lost to the 115-ranked Federico Delbonis in Hamburg and to Daniel Brands in his first match in Switzerland. I mean look, I played well with my old racket for years? I always know I can go back to that one just in case. So the matt black frame went on ice while he healed his back and rebuilt his confidence for the US Open swing—but the door had been opened, and it remained firmly ajar. I will test more rackets again after the Open. It was just a difficult spell I went through in Hamburg and Gstaad when I started playing with the new prototype. And having the bad back, I couldn’t really get comfortable enough or know about it enough to be quite honest. My mind was with my back more than anything else… I’ll go back to the racket I know, the racket I have won everything with, play with that one for these weeks, and then we will look again at the situation after the US Open. It was a very difficult year… After [Indian Wells] I fell behind with my training and was unable to catch up again because my back problems soon returned. In the summer, too, it would have been better to have given up in Hamburg and Gstaad. These problems cost me a lot of time and threw me off course. But no year is lost. In the circumstances, it was actually an interesting season. It’s no joke being injured, of course, but I had to get through it, I had to question everything. Returning fitness and confidence were starting to bear fruit in his results, but he was true to his word and continued to ‘move along’. With winter exhibitions ca ncelled to focus on training and Stefan Edberg appointed in an ‘inspirational’ role, Federer looked again at the racket, as promised. The good thing about the racket is that I’m not thinking about it, which is key. Playing point for point, match for match, and not wondering is it going to be OK. It feels like longer than a few months, so it proves to me I made a big step ahead. Brisbane and Melbourne gave me confirmation that it’s been a good switch, it’s been an easy one: no drama, very happy. 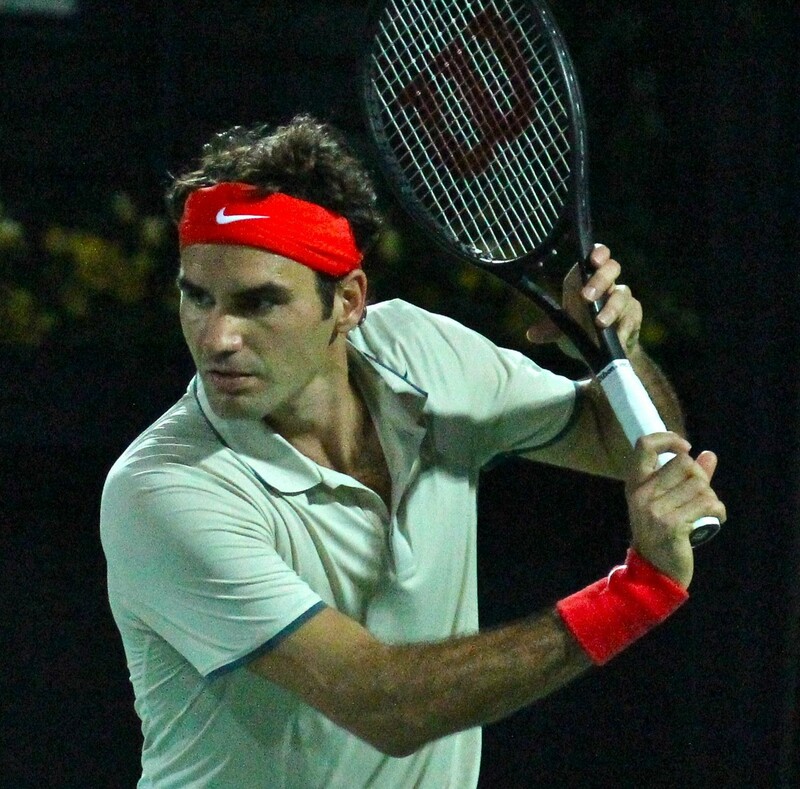 He was right: This still-black, rather beautiful racket now looks entirely right in the Swiss right hand. It seems to produce a deeper and more consistent pop—though that may simply be Federer finding its bigger ‘sweet spot’ more readily. 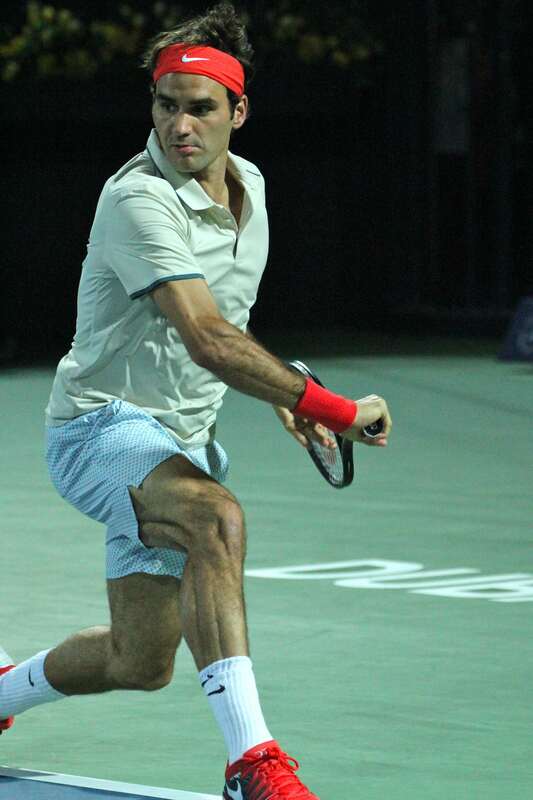 His serve and forehand seem to have a little more bite—indeed many forehands on the fast Dubai surface flew long until he brought them under control. But it is—as many anticipated—on the backhand that the reward is most obvious. As usual, Federer’s opponents in Dubai targeted that wing, but even above shoulder level, he made fewer shanks and generated more power. Well, not much, but he did play much better backhand, you know. End of second and the whole third set was working really well for him. Whenever he had an opportunity to open up with the backhand along the line, he did, so that’s a shot that won him a couple of crucial points. Well I mean, at the end of the day, you’ve got to be able to play accurate, you know, very accurate, because the closer you can hit it to the lines, the more your opponent is not sure if it’s going to go in or out. You can hit winners, keep your opponent guessing. But I did have times where maybe I didn’t serve so well or I struggled with my backhand with the timing and so forth, and [now] I feel like even on a bad day, I have the power on the serve, and I do hit my backhand easier now. It’s just important that I can do it consistently at the most important stages of the match, in the biggest matches, and that my forehand is clutch when I need it. I think that’s really what I expect from the racket, and so far it’s been very good. I must say I have been playing in quite quick conditions this year. Brisbane was really fast, and Melbourne was average. Then here now, it’s quick too. I’m looking forward to see how the racket is going to react a little bit when it’s slower, like in Indian Wells for instance. That test is just around the corner, but it’s hard to envisage a switch back to his old racket whatever the results. Because, of course, the extra eight square inches of string that Federer now wields is not the sole reason for his resurgence. He has Edberg in his box, he is using increasingly aggressive tactics, his net game is improving before our eyes, but the driving force for all these developments is the man himself. As he said in London, “I always see the glass half full.” And open-minded optimism is a powerful force.